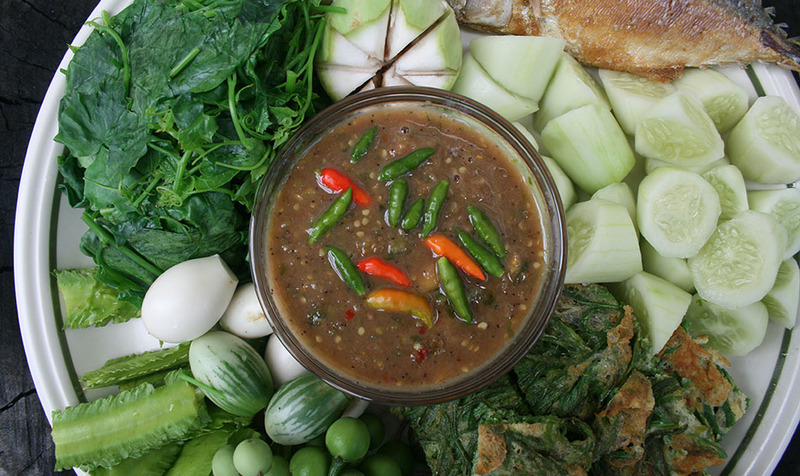 Naam Prik Gapi is one of the oldest of Thai foods which is still eaten today. Dips like this are eaten with either raw or boiled vegetables and fish. This type of food pre-dates the Chinese introduction of woks and cooking oils. This is a very popular Central Thai dish. Pound the garlic and chilies together in a stone mortar and pestle to make a rough paste. Add the shrimp paste and pound to mix. Add the palm sugar, and pound to mix. Add the hairy eggplant slices and lime juice. Mix well and place in a small bowl to serve. Garnish with small Thai chilies or pea eggplants. Serve with vegetables, cut as shown. You can also serve with slices of ‘cha-om’ omelette, which is made by mixing 3 eggs with 1 cup cha-om leaves and frying in oil on high heat until set and browned on both sides. The quality of your naam prik gapi depends on the quality of your shrimp paste. Most of the commercial (and sadly, export) brands are really strong smelling, and not very fragrant. We get our shrimp paste at Bangkok's Aww Daaw Gaaw Market, near the Chatuchack Weekend Market. If you're outside Thailand, and have friends coming to visit, ask them to pick up some for you while here. If you're outside Thailand, and Thai vegetables are hard to come by, you can serve naam prik gapi with pretty much any raw vegetable. thats my most favourite dish !! ps. why i dont see “ma kuea yuow tod kai” in the pic ? This reminds me of Vietnamese mam nem (fermented anchovy paste), except with crushed pineapple. I love dipping it with Thai eggplants too. the asian food store i go to did not have shrimp paste. They did have a million different kinds of crab paste though, so I got that. I am looking for shrimp paste, but till then, will crab paste work?